Our hearts our heavy with the loss of our dear dog Nala. May 4, 1995 was her birthday. She died on January 20, 2010 – she was 14 years and 8 months old. 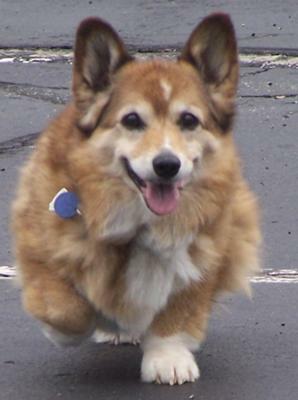 Nala was a purebred Pembroke Welsh Corgi. There is an author and illustrator named Tasha Tutor who often uses Corgis in her works. It is her illustrations that made me fall in love with Corgis long before Nala became a reality in our lives. John had been told he could have a dog when he was ten (I caved at the age of nine). Lauren, John and I picked Nala up from a breeder in Brighton, MI. There were just a girl and a boy puppy. We picked the girl since she was clearly the ambassador of good will (a title she earned for the rest of her life). Nala was named in the car on the way home from the breeder’s. Nala is a lioness in the animated Disney movies, The Lion King. John had just seen the movie, and with no hesitation knew that was the name for his dog. And so began our 14 plus years together. All puppies are cute but Corgi puppies with their short legs and floppy ears are for our family the most endearing of all. It took months for her ears to stay up. First they were down then one would be up then down then the other would be up then down, and one day they both stayed up. Nala’s oversized ears were a source of discomfort to her much of her life and she eventually lost most of her hearing and couldn't tell what direction sounds were coming from. You would call her name and she would take off in the opposite direction, anxious to find the human who was calling her name. We took to waving our arms in her later years since there was very little that she could hear and it was never clear how much she could see since her eyes were cloudy with cataracts. What she could see was the darn squirrels in the trees. They kept her very busy and occupied for many an afternoon. When she was younger she would chase them. As she got older she would just bark obscenities at them. Even with her eyes cloudy with cataracts, they were the most expressive beautiful brown eyes I have ever seen. Over time we learned to read her eyes like a sign she would have written. Her eyes could melt your heart. If you didn't feel like going for a walk, her eyes would change your mind. No body language, no barking, just the most expressive big brown eyes imaginable. On her walks, Nala never missed an opportunity to cross the street and greet a stranger or run up to old friends to greet them. She was always on the lookout for a new friend to greet. Taking her for a walk could be zigzag patterns of "hellos." Nala and Gary became best of friends in the last year. Gary would walk Nala many times each day and took tender care of the old girl. Some of her accomplishments in her younger years include eating a hole in the dry wall of a flat wall (got to wonder how she got started), standing on top of the dining table (feeling very tall), and chewing off two toes of the claw foot round oak dining table. She was also accomplished at vacuuming the floor for any crumb of food. She loved it when we had company, not only so she could be the ambassador of good will but also so she could perfect her vacuuming skills. Some of my favorite memories are of seeing her smile. Dogs do smile. When we were at the cottage, she would sit on the deck, look around at her family and out onto the lake, and smile. I watched her do this many times. She loved being outdoors with her family. One of the endearing qualities of a Corgi is that they love to sleep upside down. All of us in this family have many images of Nala sleeping on her back with her short little legs bent with the musical rhythm of her snoring. She liked to sleep upside down at the top of the stairs so that she could be aware of the comings and goings in the household. For almost 15 years Nala watched us come and go. John went from a middle school boy to a grown man living in Los Angeles. Lauren went from a high school girl to a woman living in New York. Every homecoming, Nala greeted us with unbounded energy and enthusiasm. If I was gone twenty minutes or if one of the kids was gone for months on end. Her greeting made us feel important, like we were special. The ambassador of good will. The health issues were many for Nala. Lots of trips to the vet. Pancreatic, vestibular problems, oh and then there was the time she ate a three layer chocolate cake and had to have her stomach pumped. The last year of her life was a series of pills and visits to see Bill McArthur, her vet. Eventually her body gave way to complete kidney failure due to old age. It was time. We were so fortunate to have her in our lives. We are so sad at her passing. Our lives were made richer by her sweetness. Life will go on but there is a void, a hole in our hearts for such a tiny yet powerful and gentle being. It seems that kidney failure is the thing that happens to most dogs when they have lived such a long life as Nala had, and as Lucky had too (he was 16 and he just went to sleep on 4/5/10). It's a shame that they have to go- since we want them to stay around and stay young forever- I always wished that too. Thank you for sharing her beautiful memory with us all on this website. I like to think of it as a way to keep them constantly alive and in our memories. She was one lucky dog and you were one lucky person, to find that love. Does life get any better? Smile, you are still loved.